As the weather changes, winter takes different forms. However, one thing is for certain: critical driving situations can, and do, present themselves during these months. Continental Teves, a major supplier of brake systems, chassis components, vehicle electronics, tires and technical rubber products has compiled a list of driving tips to aid drivers when navigating snowy, icy roads. â€” Be patient. Give snowplows time to clear the roads and apply road salt before you venture out. During severe weather conditions, it might be wiser to just stay home, putting off errands until conditions improve. â€” Check road conditions before traveling. Use extra caution when driving on bridges and overpasses; they freeze over first. Be aware of black ice, a condition that occurs when the road appears to be dry but is darker and shinier than usual. Slow down when driving through these areas. â€” Always wear your safety belt! Three of five people killed in vehicle accidents would have survived their injuries had they been wearing their seat belts. Children 12 years and younger should sit in the rear seat. Infants weighing less than 20 pounds or under the age of one should be placed in a certified, rear-facing child safety seat. Children up to four years of age should be placed in a certified child safety seat. â€” Plan Ahead. If possible, use alternate routes to avoid traveling up or down steep hills or on roads with sharp turns. Even if the drive takes you a little longer, it’s better to get there safely. â€” Prepare your vehicle for winter driving. Keep your tires properly inflated, including the spare. Check tread depth regularly for excessive wear. Balled tires are an extreme hazard on icy, snowy roads. Consider snow tires if you live in an area with large amounts of snow. Replace wiper blades as needed (every six months to a year), and keep the windshield wiper reservoir filled. â€” Keep extra distance between yourself and the car ahead of you. Slick conditions can greatly increase the distance it takes to come to a stop; stopping distances on snow may be 3-5 times longer than on dry roads. â€” Take your time. Everything takes longer in slippery conditionsâ€”accelerating, stopping and turning. Avoid making any abrupt direction or steering changes; gradually accelerate, brake and steer. Allow for increased travel times. â€” Stay Alert. Make sure you’re aware of what other drivers around you are doing. If you must use your cell phone, pull off the road in a safe area. And keep in mind, some cities and villages now have laws against driving and using a cell phone. â€” Stay in Control. While driving on slick pavement, if your vehicle begins to skid, take your foot off the brake and gas pedals and turn in the direction of the skid. If you have to stop on a slippery surface and your vehicle is equipped with an anti-lock brake system, remember to ‘Stomp, Stay and Steer’ (Stomp on the pedal, Stay on the pedal and Steer to a safe path). If your vehicle is not equipped with ABS, you may need to pump the brakes slowly to bring the vehicle to a stop. If your car begins to hydroplane while you’re driving through standing water, hold the steering wheel steady and lightly apply the brakes until the wheels regain contact with the road. â€” Turn on your Low Beam Headlights. If your vehicle is not equipped with daytime running lights, keep your low beam headlights on, no matter what time of day it is. â€” Get Help Quickly. If you encounter problems, pull off the road, if possible, open the car hood and turn on your hazard lights. Place a ‘Call Police’ sign in the rear window. You can always count on some real cold in the atmosphere here at Drive…He Said’s” Chicago abode. Not that it would stop the 2013 Kia Optima SXL, glass roof and all, from seeking it’s own rarefied air. Audubon Society members can observe and ponder the differences between the robin (not theÂ boy wonder) and oriole in the Optima SXL mid-size family sedan. Driver and front passenger get a power sliding moonroof. Two six footers and junior comfortably share a fixed glass panoramic roof with powered shade aft. Birds should especially notice how well the dark roof contrasts with the Snow White Pearl exterior of our Optima test vehicle. Nowadays the Optima mid-size family car is built in West Point Georgia. Our tester was in top-tier SXL trim. Meaning that at $35,000 it wanted for little. Not counting lane departure warning/correction, guided park assist, or intelligent cruise control. Power and motion are provided by SX model donations: a turbocharged 2.0-liter inline 4-cylinder gas engine, with direct injection,Â and a 6-speed manumatic slushbox. Additional comfort and convenience includes heated and cooled front seats and audible park warning. A baby could probably be taught to use the 6.5″ touch screen controlling UVO handsfree communication/media and hard drive navigation unit. The “L-for-Limited” treatment pitches Nappa over normal seating steer-hides. The side mirrors do a power fold-up act second only to the Lamborghini Aventador’s “scissor” doors.Â There are the functional bonuses: steering wheel mounted paddle shifters, more aggressive 245/45 series rubber and stiffer damping. Visual benefits include the four-wheel disc brake calipers painted in “look at me red” poking through mirror-finished 18″ alloy wheels. There are splashes of chrome whether inside on the pedals, or out on the tasteful trunk spoiler or the door sills. 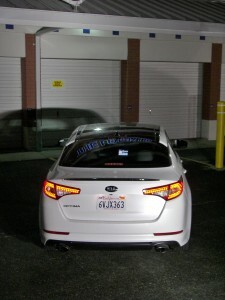 From the “theater marquis” are the illuminated red “KIA” emblems on driver’s and front pax rocker panels. Since we last fielded an Optima (http://www.chicagonow.com/drive-he-said/2011/03/2011-kia-optima-ex-gdi-my-side-mirror-contoller-is-better/#image/1), Kia has gone to work on matters previously deemed three-fourth’s-baked. Right off the bat, you notice this sporty front-drive sedan actually has the stop to complement the go of the engine’s 274-horsepower. Improvements in braking are “night and day” different over previous Optimas.Â Tap the pedal and hold on. There is actually some serious bite with these pads, at least until the limit of pedal travel. And those limits may be more owing to the tuned-for-placid Kumho Optimo all-season rubber. The stiffened Mac strut / rear multi-link setup has further tamed body roll and dive. Any semblance of torque steer is eliminated by an aggressive traction / stability control algorithm. More a work-in-progress is an electric power steering assist which is heavy enough at low speeds to produce sore flexors and which fights jerking motions. A suspension which isolates your morning latte over railroad tracks manages to crash over larger road divots. Uneven pavement yields modest pitching. That’s gotta’ be the low-profile tires. The six-speed transmission, despite the nimble paddle shifters, is remiss to upshift smoothly when cold. Still a paradigm of smoothness under all but the most aggressive throttling is the powerplant. Off the line, the Kia Optima SXL commands respect completing the null-60 mph run in a tick over 6 seconds.Â Fuel economy stands in the not-too-shabby 24 mile-per-gallon range. 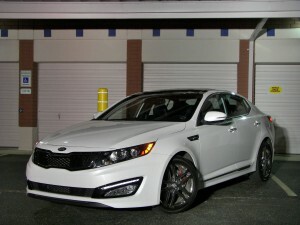 Despite its major “hits” the Optima still has some “misses” to address. The buttery leather which trims the well-proportioned, fully-adjustable steering wheel is too slippery when the pace picks up, and some road impacts transmit through. Legible and logically placed redundant controls on the spokes are too dimly lit at night to be of much use. Successful voice command dialing from a downloaded phonebook will be limited to single syllable contacts. Such an intuitive media selection screen interface is worthy ofÂ a sound system which offers spacial accuracy. Infinity’s dash-top mounted center channel “5.1” speaker doesn’t cut it.Â At freeway speeds, a cabin unmolested from unpleasant powerplant and drivetrain noise, is mobbed by wind noise. Could it be the twin rubber door seals, down by one layer to the triple seals found in the Volkswagen Passat and Toyota Camry?Â In areas of fit, a creak emanating from the driver’s seat each time we exited our Optima SXL was auspicious for a car with with less than 10K miles on the clock. So the suggested price may elicit some “That’s baseÂ BMW 3-series territory” moans. In its defense the Kia Optima SXL’sÂ responsiveness to inputs and predictability in handling, in a front-drive family sedan with a 15 cubic foot trunk, tugs at our enthusiast heart strings. The exterior styling most closely approaches a “4-door coupe” in the segment without being too “swoopy-trendy.” Getting a rear-view camera on a Volkswagen CC VR6 requires forking over$3K more. Contrasting stitching schemes on seating and interior trim, with subdued dark simulated wood grains evoke a professional place to conduct business. A driver’s throne, though finicky to adjust,Â is suited to spirited track time. There is the decadence of heated rear seating. And a center console canted slightly towards the driver as in Bavarian sport sedans of yore.